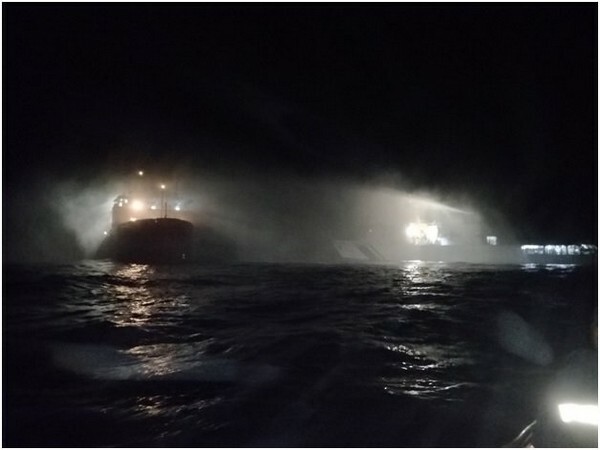 Mangaluru (Karnataka) [India], March 16 (ANI): Two Indian Coast Guard ships doused a major fire on board a ship, carrying around 30 crew members and 16 scientists late last night off the Mangaluru coast in Karnataka. Islamabad [Pakistan], Feb 24 (ANI): Amid the growing tensions between India and Pakistan, Islamabad has decided to move troops from to its eastern border. New Delhi [India], Feb 13 (ANI): A slum caught a massive fire in Delhi's Paschim Puri area in Wednesday resulting in the burning down of almost 250 huts. Katra (Jammu and Kashmir) [India], May 23 (ANI): The pilgrimage yatra to the Shri Mata Vaishno Devi Cave Shrine was suspended from new battery car track on Wednesday afternoon after a major fire broke out in Trikuta Hills in Jammu and Kashmir's Katra district. Ludhiana (Punjab) [India], Apr. 27 (ANI): The fire fighting operations are still underway to douse the fire which had broken out in a garment factory at Bahadur Ke Road in Punjab's Ludhiana in the wee hours of Friday morning. Mumbai (Maharashtra) [India], Feb. 11 (ANI): A major fire broke out at a gowdown near Maya Hotel in Mumbai's Mankhurd on Sunday. Madurai (Tamil Nadu) [India], Feb 3 (ANI): A major fire broke out in Tamil Nadu's Madurai Meenakshi Amman temple complex on Saturday. New Delhi [India] Jan. 25 (ANI): A major fire broke out in a godown in Mundka on Thursday. No casualty has been reported. Jammu (Jammu and Kashmir) [India], Jan 4 (ANI): The Border Security Force (BSF) on Thursday said they responded effectively to the ceasefire violation by Pakistan in Jammu and Kashmir's Samba sector, in which Islamabad suffered a major loss. New Delhi [India], Dec 29 (ANI): Bollywood filmmaker Karan Johar is 'shocked and deeply saddened' following the killing of 14 people in a major fire that broke out in a building in Mumbai's Kamala Mills compound on Friday. Nagpur (Maharashtra) [India], Dec 25 (ANI): The mortal remains of Major Prafulla Ambadas Moharkar, who was killed in the ceasefire violation in Jammu and Kashmir's Keri sector on Saturday, arrived at the Air Force Station in Sonegaon on Sunday evening.